DJ's that redline the mixer....... Why do some feel louder is better ??? 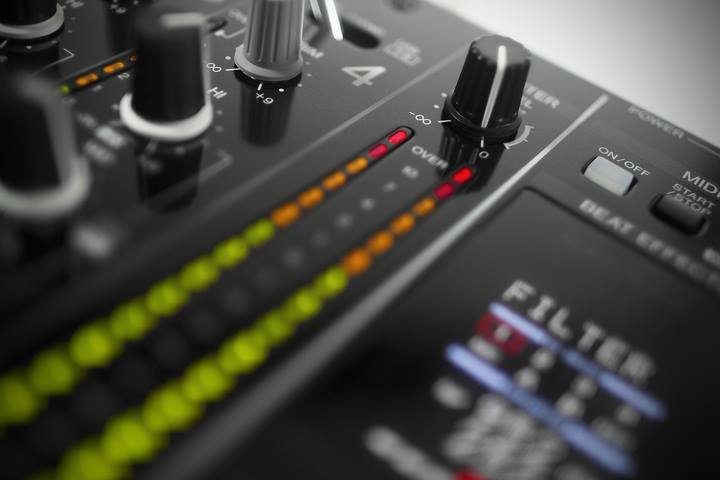 A recent discussion on the DJKIT Facebook page regarding redlining mixers attracted over 40 comments and over 20 shares. The post itself was seen by over 12,000 people from not only the Uk but europe and as far away as India. It seems to be a topic that lots of dj’s have many different opinions on. But what is the correct procedure with red lights on a dj mixer?? Lusius says:I think the loudness war played a part in this. If your first track has been limited to death with an RMS of -8db, and your second track is at around -12db RMS, then the second will sound a lot quieter and up goes the gain pushing the peak into the red and beyond, not realising its the RMS that needs to go up, not the peak. Neil says: i think never in the red, only in the Amber 1 notch if a song peaks in parts if it can be helped. But having said that most professional DJ's I've seen mixing like to full on red bar it to the max. Louder is certainly not better, I’d always prefer to have higher quality audio than louder audio! Unity gain (0dB) is my personal preference of a reference point, this means that if your entire DJ Equipment system is running at 0dB the signal is not being further amplified or reduced. As a DJ, you’d want to set your master to a 0dB level – now on professional audio mixers, the ‘0’ mark on the master volume will be a much higher level than 0dB – this is where you’d ideally need to keep an eye on your VU Meter on your output stage to ensure that your audio does not go above 0dB on your VU meter indicator LEDs. Rarely will you start an evening on 0dB straight away – some nights you won’t even get near it (or shouldn’t!). On a DJ mixer, the Dj should control the track volume with their faders but their overall volume using the gain inputs on the top of the channels whilst leaving the master volume knob in it’s set position. Using this combination they can see the level they are pushing via their VU meter ensuring that it doesn’t go beyond 0dB. It also means that when cueing the DJ is able to level the tracks so that when they bring the mix in the next track will be at the desired volume to create the perfect mix. The input levels on the next step in the audio system (usually speakers similar to a CS-1000 System) should be set to a 0dB position (assuming Active PA Speakers) and at LINE level. Further amplifying a signal past 0dB may run the risk of sending a clipped or peaked signal to the next step in the audio system. Many audio systems now have in-built compression and limiting which will attempt to ‘squash’ your overdriven signal to protect the speaker but it can only take so much. When audio systems start to compress and limit you will hear the audio quality degrade, compression will make the sound sound ‘squashed’ – i.e. a reduction in your dynamics, just remember your audience can clearly hear this! So summing up + simply put – keep the system to 0dB or below to retain maximum quality and performance whilst monitoring your limit lights on your system. Also as a top tip, if you can… go take a listen to the system ‘out the front’ and see how it sounds, you’ll be amazed sometimes at the level you’re pushing into a room without realising, dancing in front of it for a few hours could be very painful for your customers!